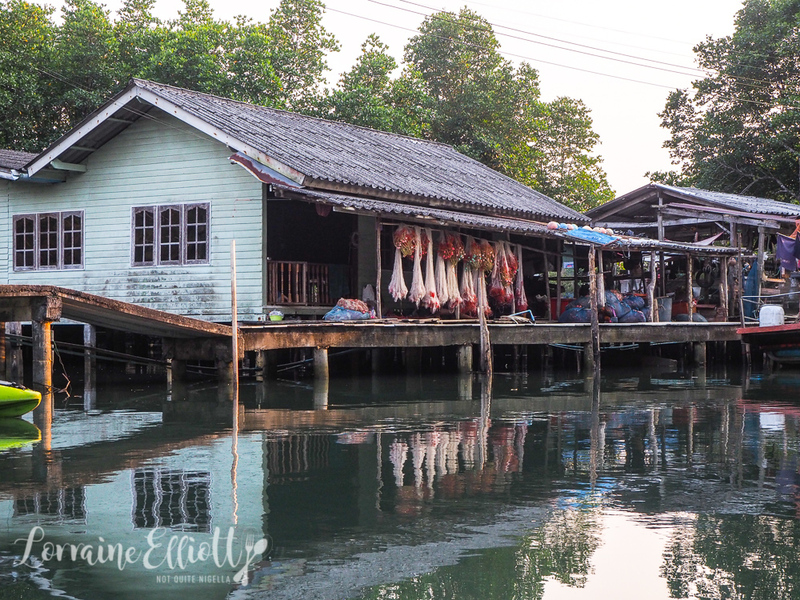 The province of Trat lies 315 kilometres from Bangkok and is either a 5 hour drive or a 45 minute plane ride away. 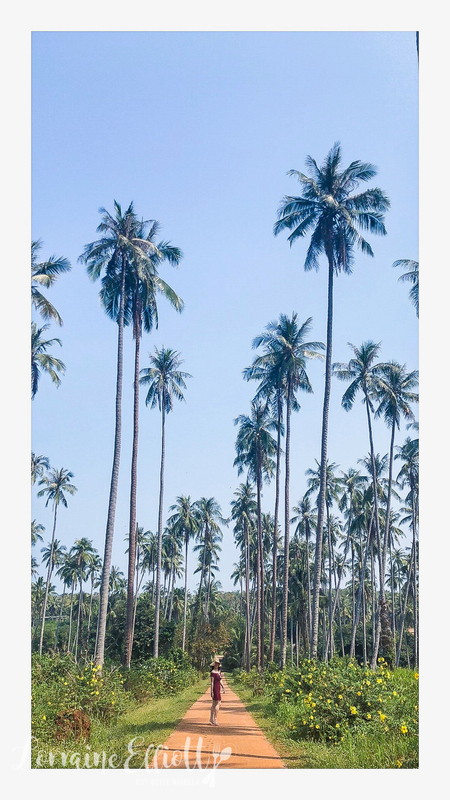 The lush green forested province is located on Thailand's far eastern side next to the border of Cambodia. With mild humidity and heavy rain it's an area mostly known to Thais as a relaxing holiday location rather than an area heaving with overseas tourists. I lift a clam off the plate from the stem and turn it around. 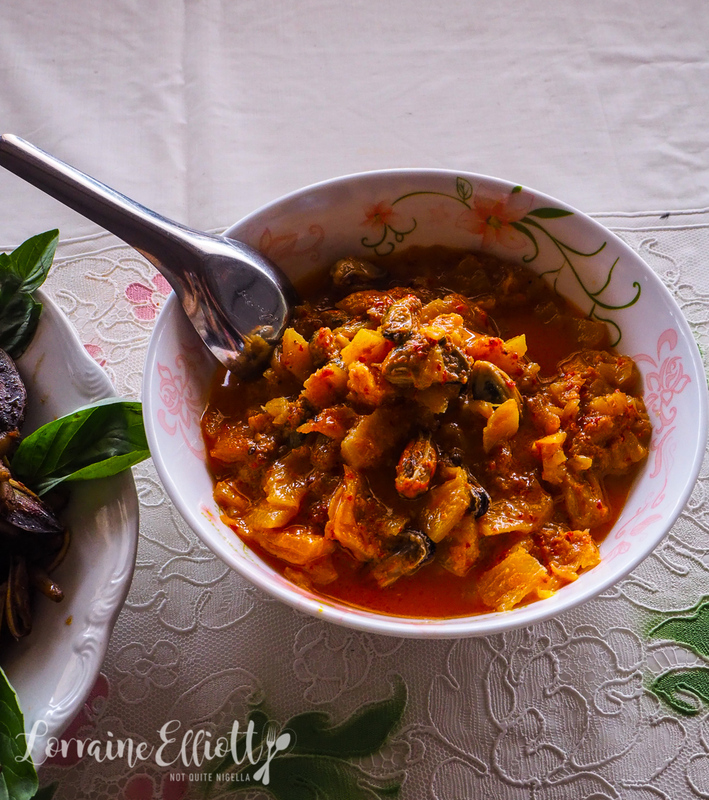 The duck beak clam with long appendage is one of the many local delicacies that you can eat in Trat. 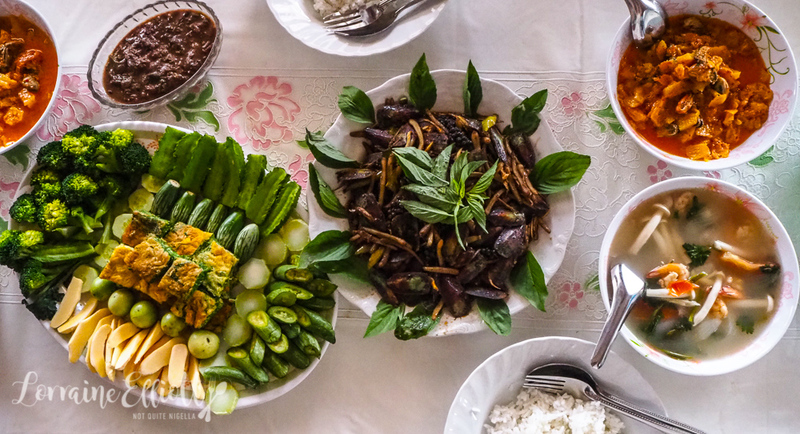 We've arrived after a quick plane ride and have settled into having a local lunch with a group of friendly women at the Baan Nam Chiao Old community. 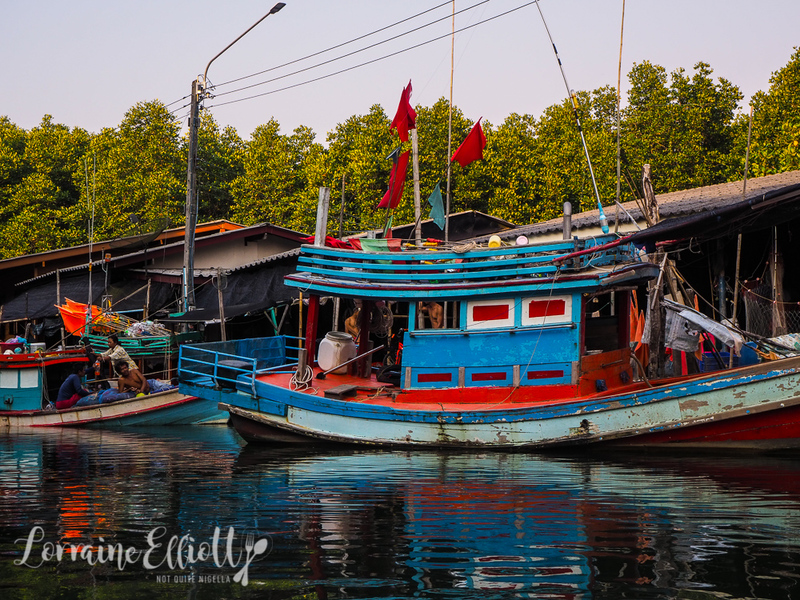 Baan Nam means strong current and references the seas that feed this community. 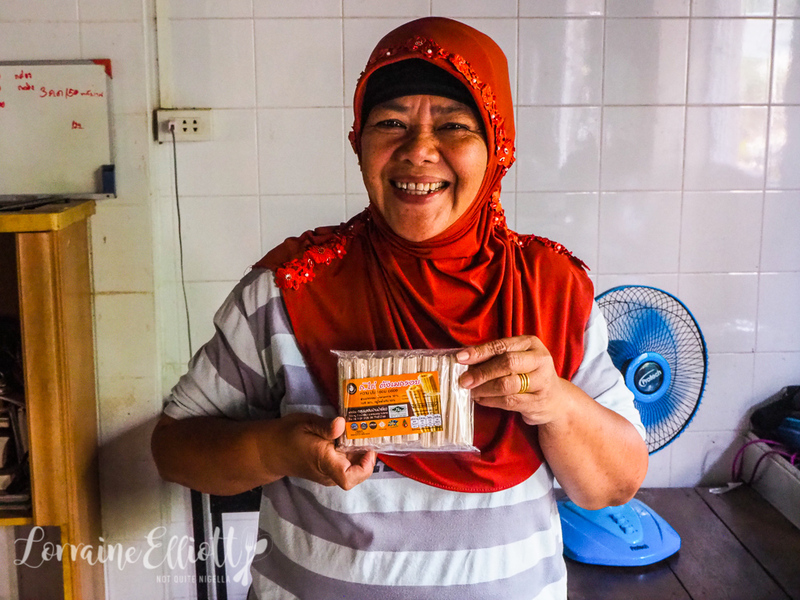 The population of this seaside town is an estimated equal mix of Buddhist and Muslim who coexist side by side - this group of women cooking for us is a prime example. 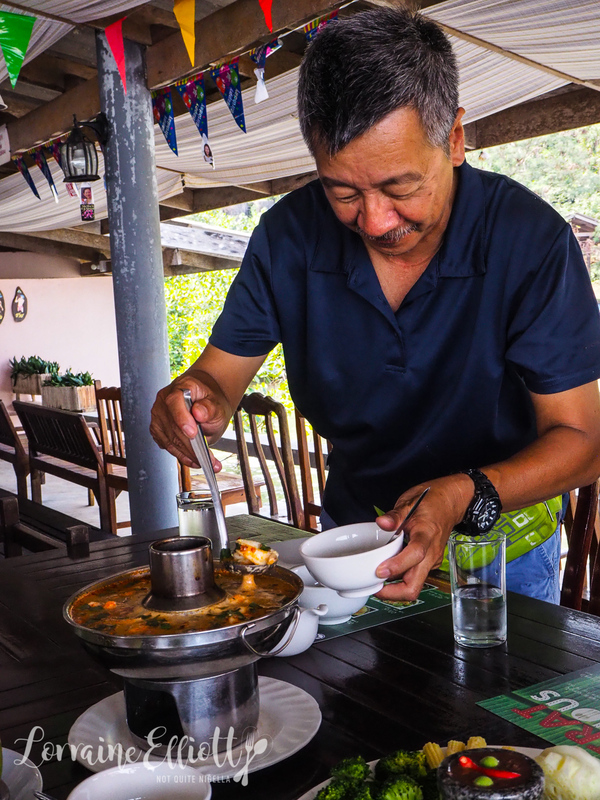 The main industry here is fishing and most dishes incorporate seafood of some sort. Back to these duck mouth clams. I take the clam tongue and chew on it. It's surprisingly crunchy and has the texture of a crisp bean or vegetable. The clam inside is creamy and slightly sweet absorbing the sauce well. 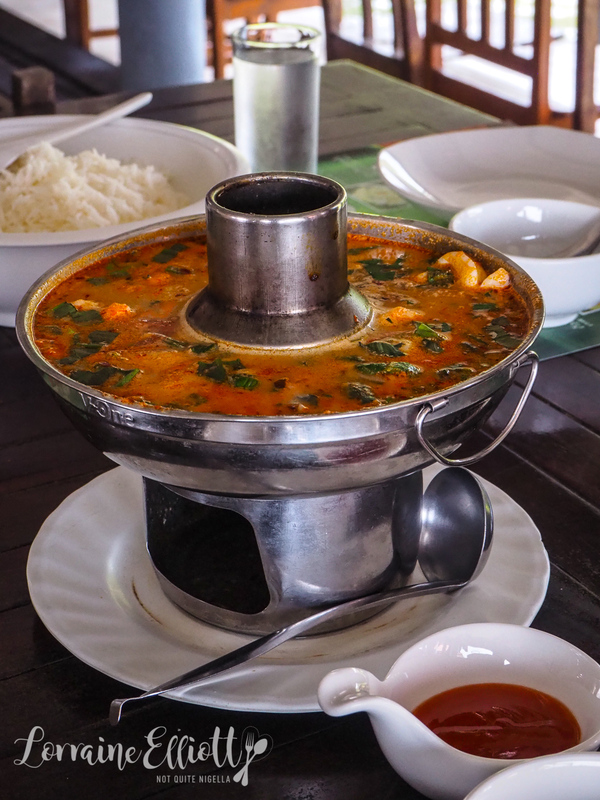 Locally grown Trat pineapple is a popular ingredient for curries but here the pineapple curry is studded with small oysters. This curry is sweet and slightly sour at the same time. 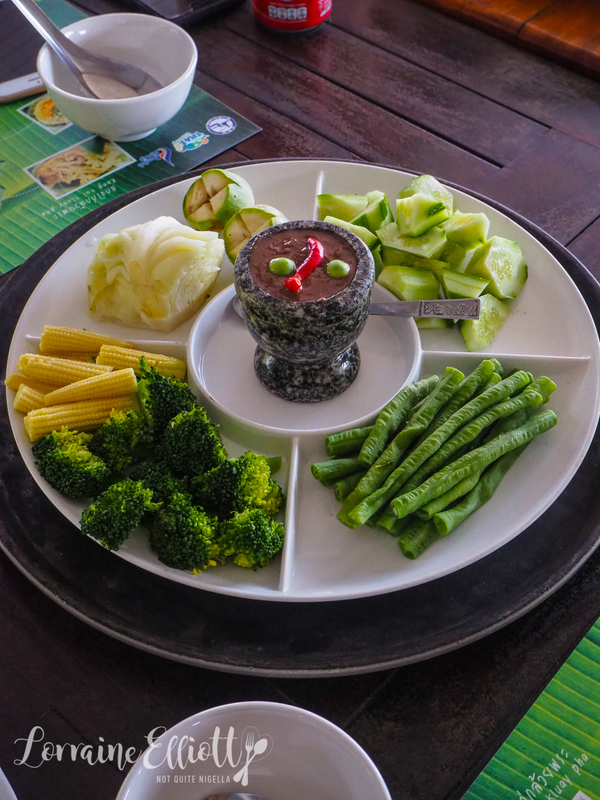 Crudites are served with Nam Prik Kapi, pungent shrimp paste made using tiny dried shrimp mixed with chillies, lime juice and salt. Lunch is followed by a hat weaving demonstration. Afterwards we move to a nearby house. 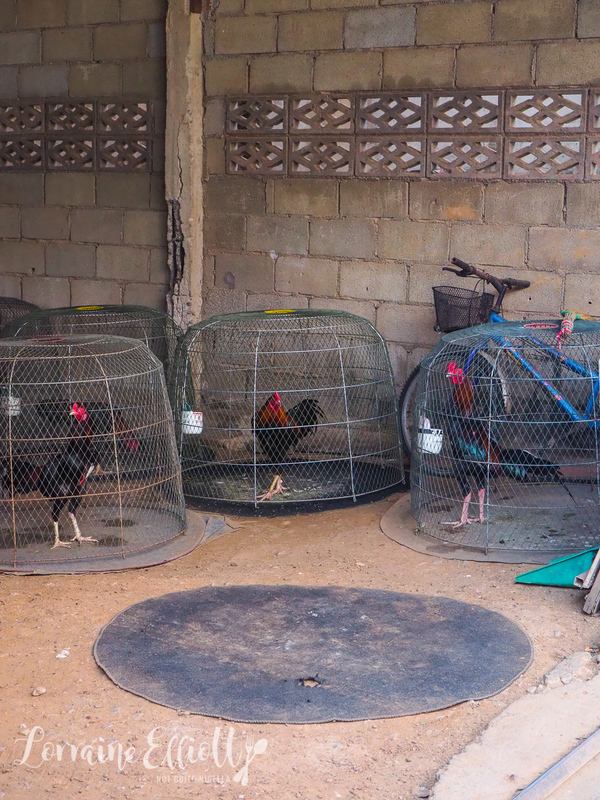 We walk past cockfighting roosters in cages and the sleepy town with the river crossing through it revels in the afternoon sun. A fluffy white cat rubs itself against my legs as I walk down a laneway where the sweet smell of caramel and coconut smell beckons us. At this factory and residence they boil down sugar and coconut milk until it reaches a hard crack stage and then it is cooled in a large bowl sitting over a bowl of cold water. Slowly and patiently they turn the mixture so that it cools down and is easier to handle. Then it is the job of one of the men to stretch it on a wooden hook-this is tiring work as the mixture is both hot and heavy. The stretching transforms it into a lighter straw colour that is then stretched into a long single piece and then the brittle candy is cut into smaller pieces with a deft whack of a finger. The candy is delicious, like a hard coconut candy in stick form. 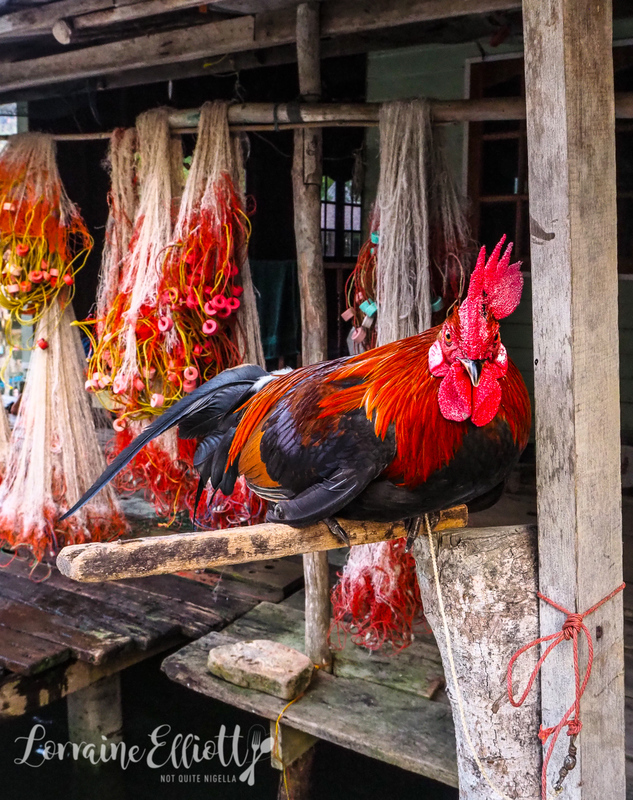 Our next stop immerses us into the world of fishermen. 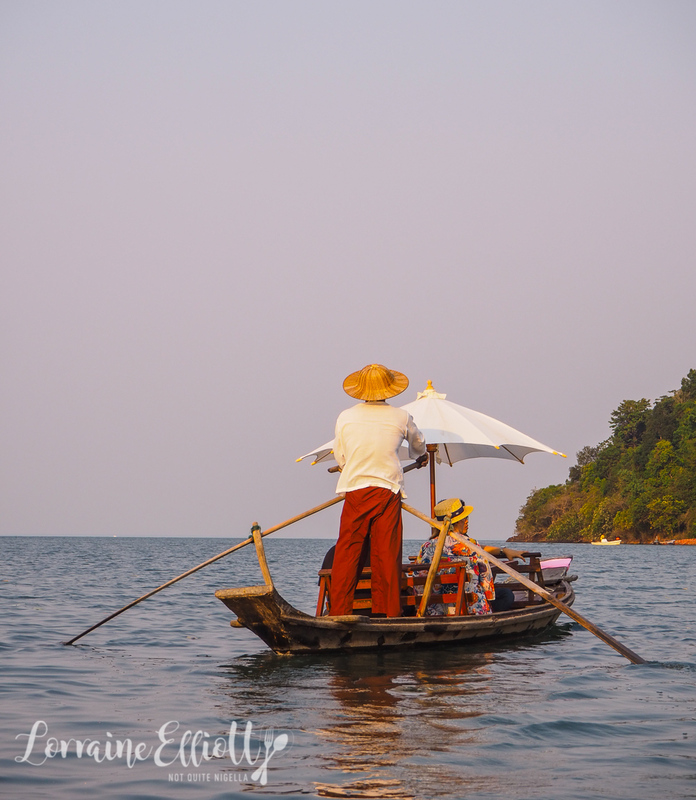 We take a ferry to Koh Chang island. The ferry ride is 45 minutes long and we nibble on Thai snacks along the way. 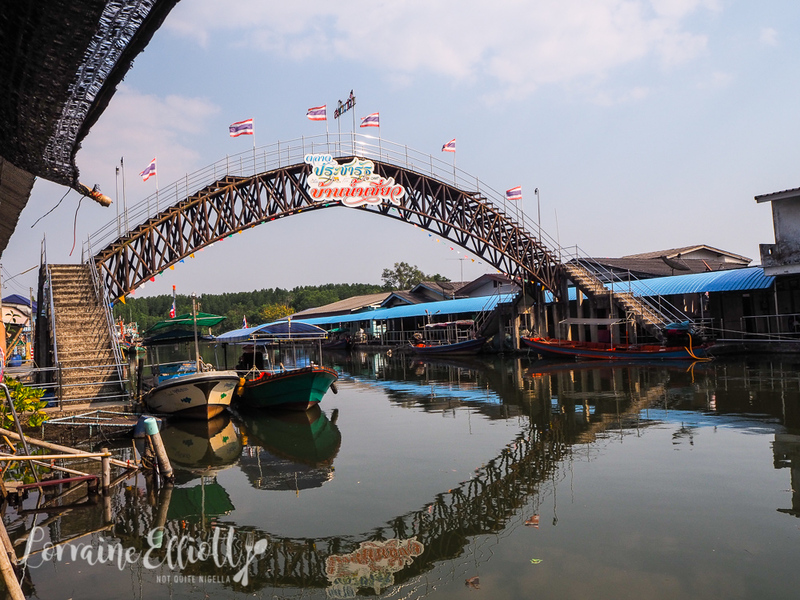 Before we know it we've arrived at Koh Chang where we board a gondola for a paddle through the mangrove forest that surrounds the fishing village. The area is busy with fishermen winding down for the day. Some are busy doing household or boat repairs, while one man bathes scooping cups of water from a bucket over his clothes. Small children read books and do homework while lying on their stomachs while a tethered chicken sits complacently observing all. He's not bothered by our fascination with him. 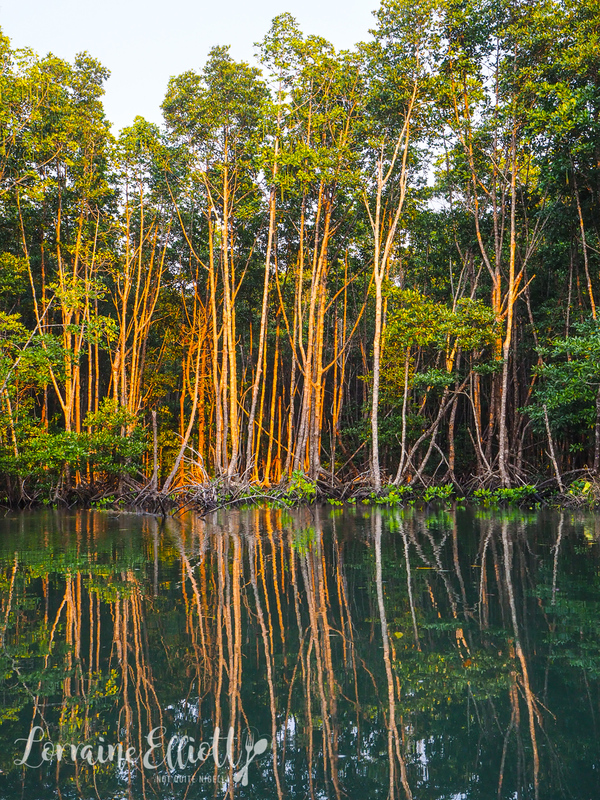 The gondola ride goes for 45 minutes out to the clearing, past gnarled and tangled mangroves. The sound of the water is all you hear and it is wonderfully tranquil. It's a 1 hour drive to our hotel for the night. 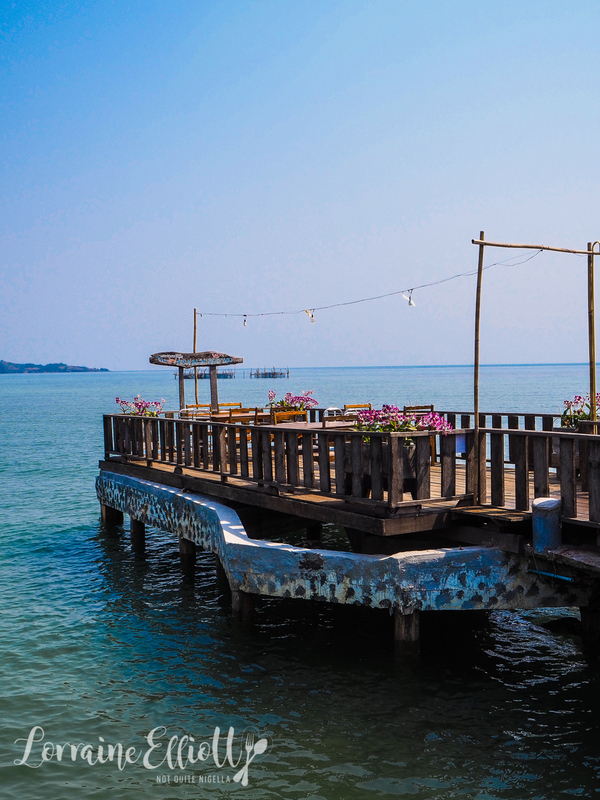 The Mercure Koh Chang Hideaway is a large resort with 141 rooms. 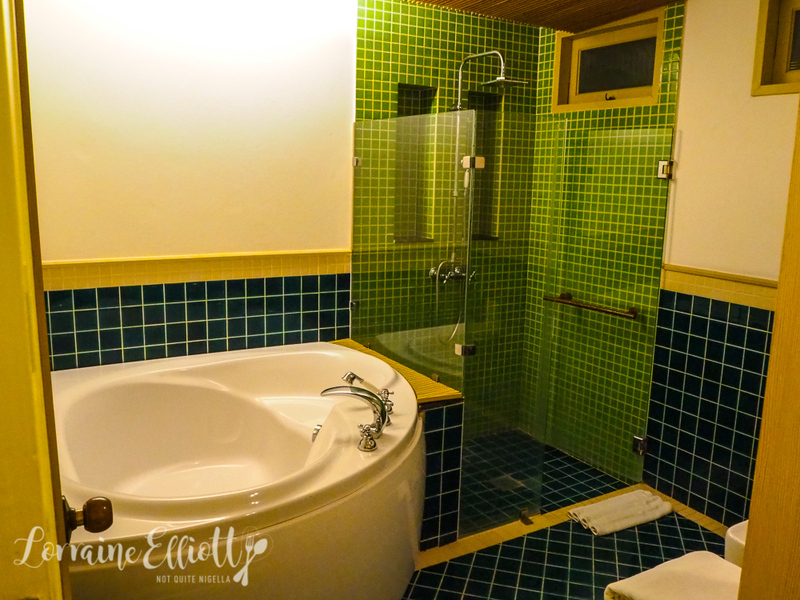 The beachfront hotel has several room categories and we are staying in a deluxe ocean view room on the third floor. 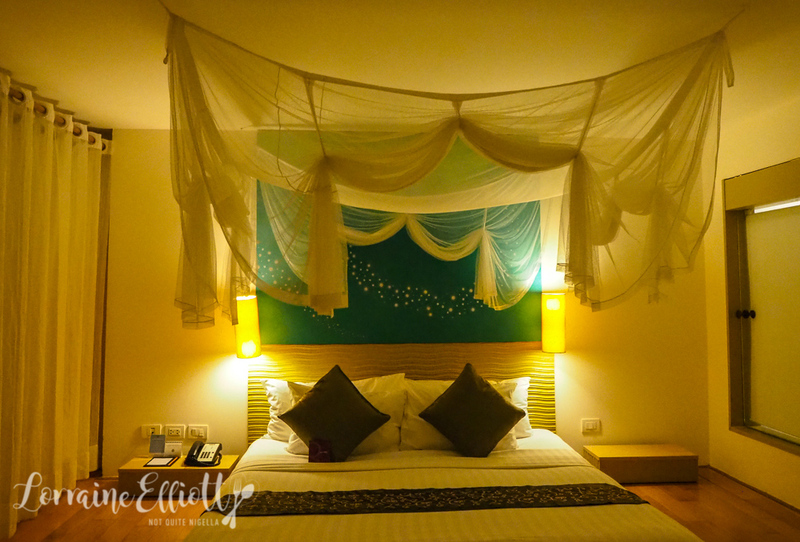 It's a 52 square metre room with a raised king bed with a mosquito net draping above. Outside is a terrace overlooking the pool and the beach in the distance. 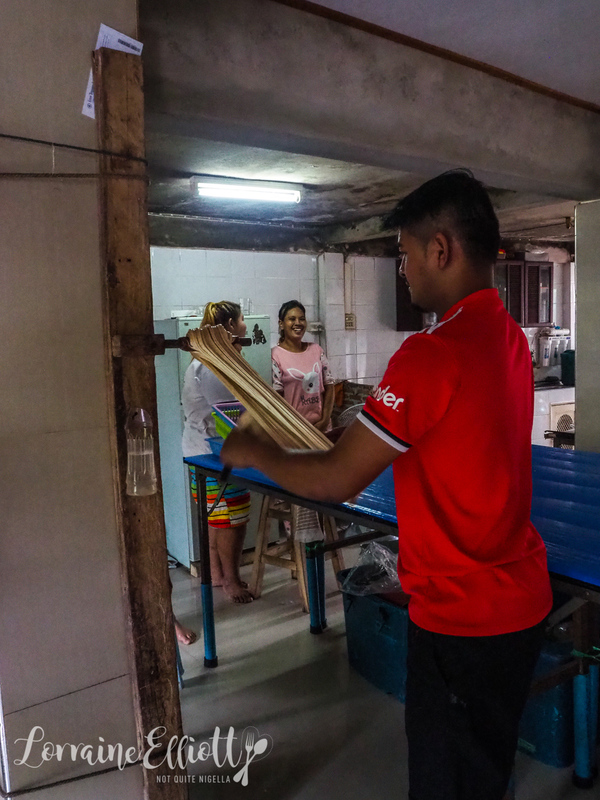 Nipon or "Onn", Koh Mak's community leader tells us that he is the fourth generation to live here on the island. 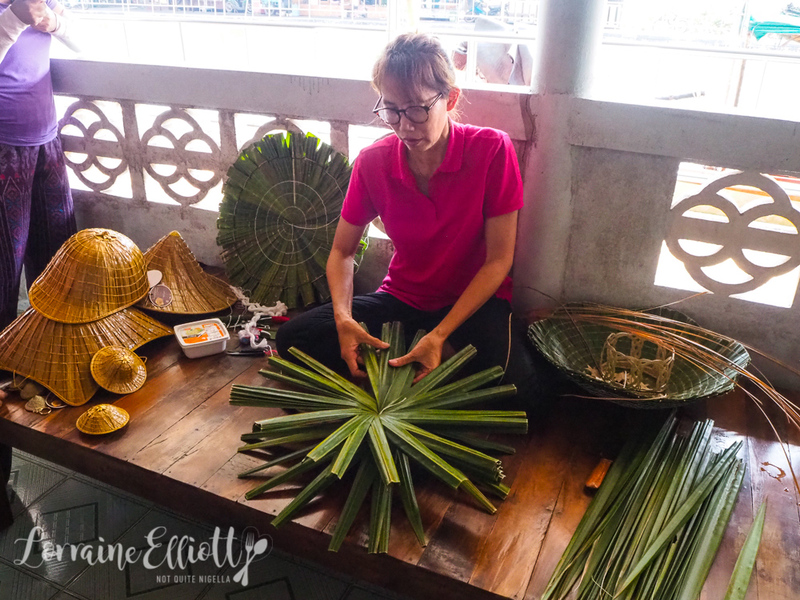 "My mum knows every coconut tree". 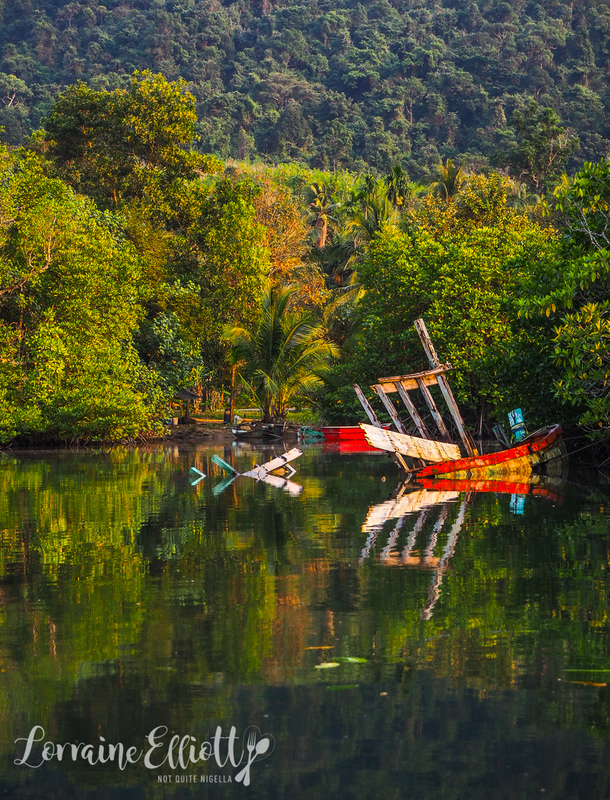 Koh Mak is an island that is making a concerted effort to become as low carbon as possible. Here you won't find jet skis to rent. Instead there are sailboats and bikes to ride. There are plenty of long windy or curvy coconut lined roads to stop to take photos as well as cliff top cafes. 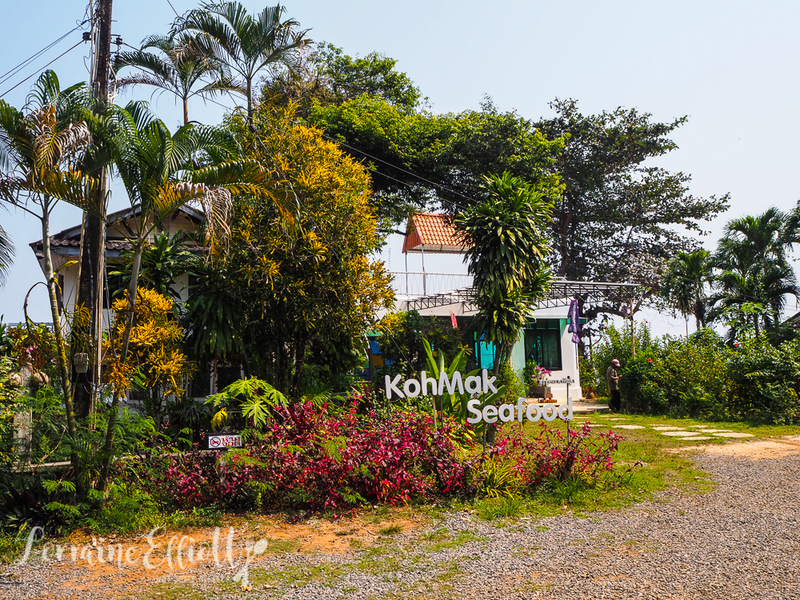 Koh Mak attracts mostly Thai and European guests. Signs warn of cats crossing and beware falling coconuts. There are just 400 residents on this 3,000 acre jungle covered island with only 30 resorts with a total of 400 rooms. The 78 year old school has just 48 students. 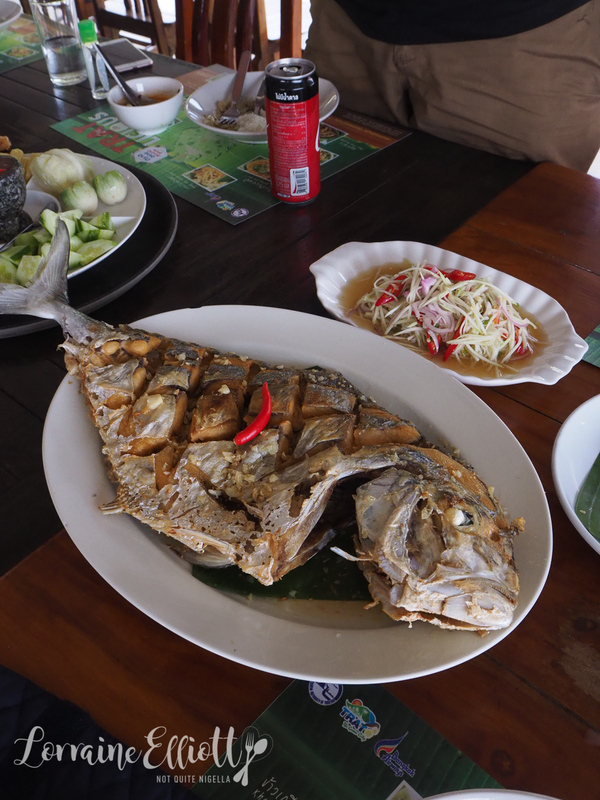 We are having lunch at Koh Mak Seafood on the south east part of the island. 90% of the produce served at lunch is actually from the island and a typical meal has plenty of locally grown vegetables and seafood. This meal is a real highlight with food taking on a twist from the norm. 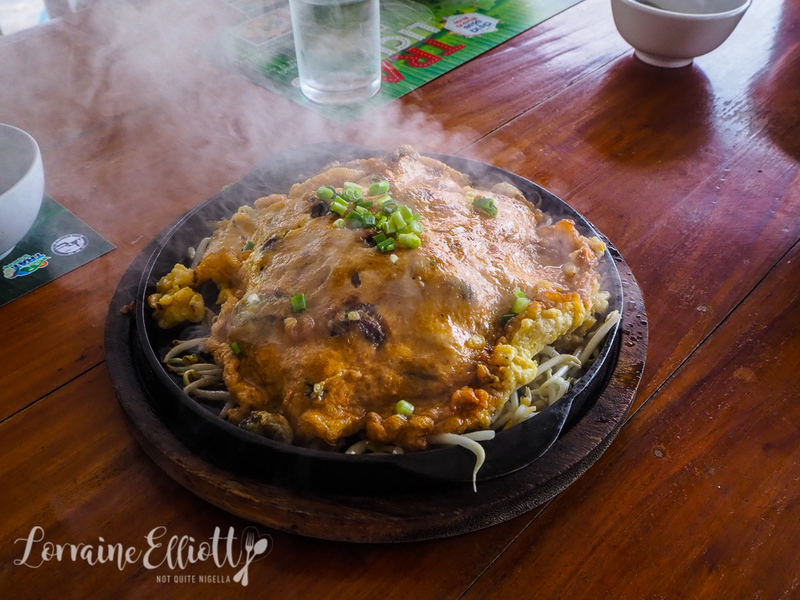 The Koh Mak Hot Pot is replete with roe on scallops, prawns and seafood and has a surprise layer of steamed egg custard on the bottom. 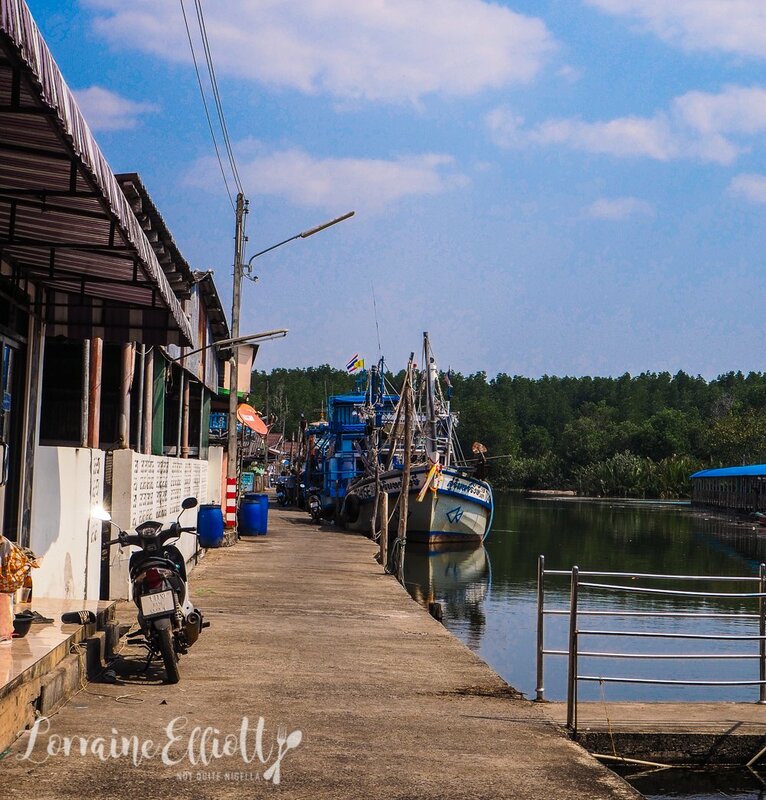 Fishing makes up a large part of the industry here and although buying seafood from the mainland is cheaper they buy from local fishermen. They have developed an app for fishermen to take photos of the fish that they catch so that people can buy it before they come back to shore. The fish that is served is deep fried and served with a delectable sweet fish sauce based sauce that you just want to drink as a soup. And what looks like a plain omelette with bean sprouts is actually an utterly moreish oyster omelette studded with tiny oysters. It's the sort of dish you wonder how it is so tasty. Or perhaps it's just the sort of dish that suits the view just so perfectly. So tell me Dear Reader, had you ever heard of Trat before (I hadn't)? 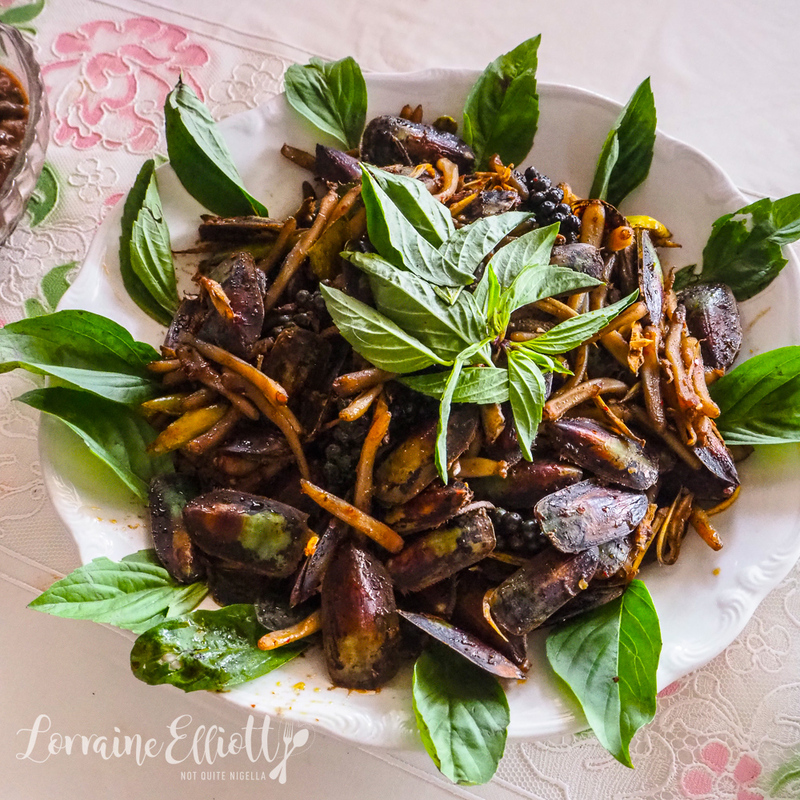 Have you ever seen clams like the duck tongue clams before? NQN was a guest of the Tourism Authority of Thailand but all opinions remain her own. 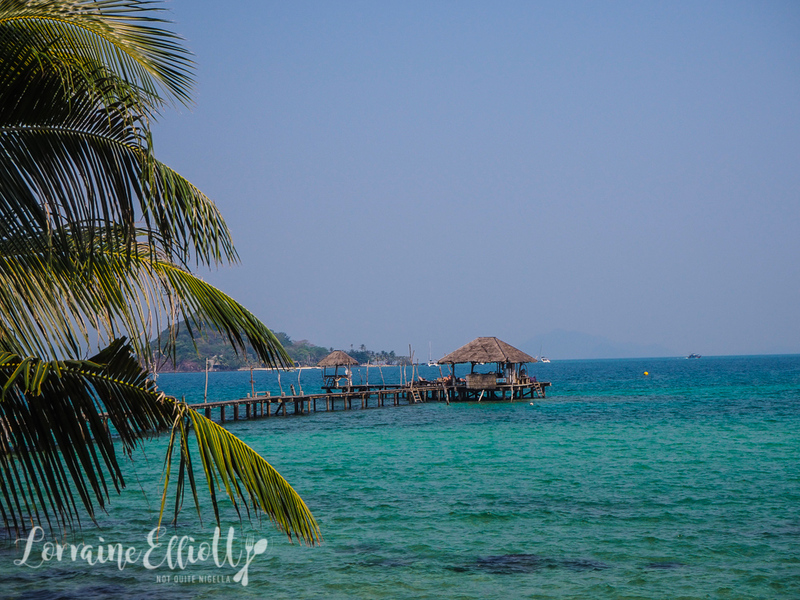 travelThere's Something About Koh Yao Noi: 13 Things To Do On This Island Paradise! 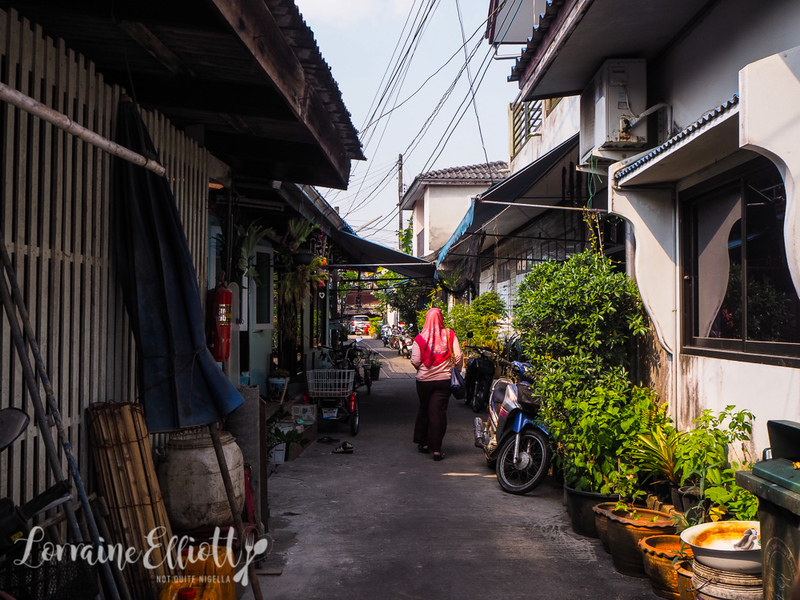 travelOne Day In Bangkok: Bangkok for Beginners! 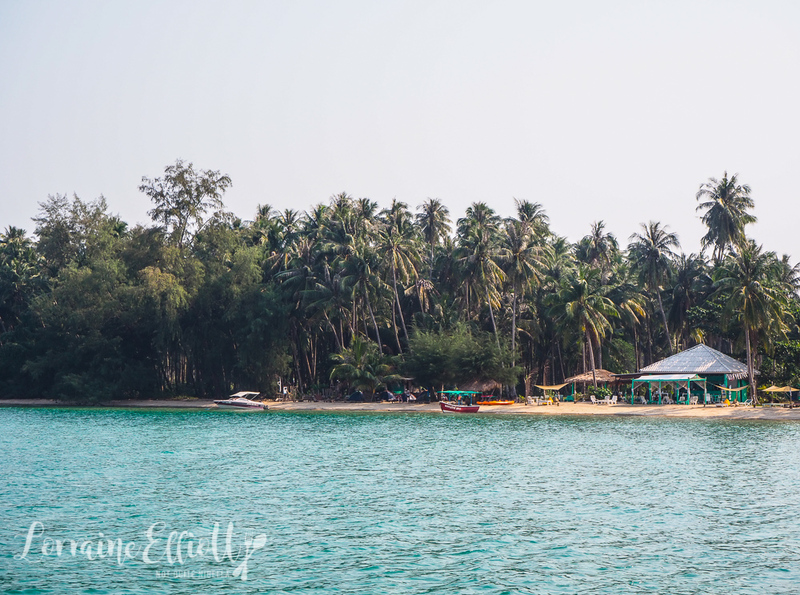 travel There's Something About Koh Yao Noi: 13 Things To Do On This Island Paradise! travel One Day In Bangkok: Bangkok for Beginners!